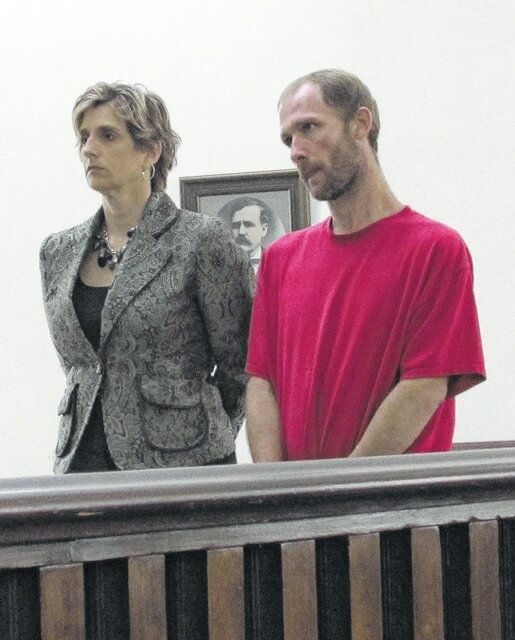 Alex Cox is pictured in Highland County Common Pleas Court with defense attorney Susan Zurface on Friday. A Hillsboro man Friday was sentenced to prison Friday after pleading guilty to a methamphetamine-related charge. Alex D. Cox, 34, pled guilty to third-degree felony illegal assembly or possession of chemicals for the manufacture of drugs. While this is Cox’s first felony offense, he was initially charged with second-degree felony illegal assembly in the vicinity of a juvenile. That offense carries a mandatory prison term. Highland County Common Pleas Court Judge Rocky Coss followed the recommendation as outlined in the plea agreement for 30 months in prison. He said the agreement said the state will not oppose judicial release to the STAR program after six months of the prison term has been served. In another hearing, Jacob W. Cox, 19, also pled guilty to third-degree felony illegal assembly. According to Susan Zurface, defense attorney for both defendants, Alex Cox and Jacob Cox are not related. Jacob Cox will be sentenced in August. Coss said that per the plea agreement, the state will not oppose community control and treatment. Kathy Ross, 44, Leesburg, pled guilty this week to fifth-degree felony heroin possession. Ross has a previous felony conviction, court records show. She is scheduled to be sentenced in August.